Trust without ethics is like a circulatory system without a heart! Ethics lies at the very heart of trust within your organization and with your stakeholders. So why are its fundamental concepts missing from strategy, marketing and economics literature? It’s like a circulatory system without a heart! We saw in Week 2 that benevolence/goodwill is a key element to trust. It’s what makes trust a leap of faith rather than a purely calculative exercise. Goodwill is what motivates a trustor to go beyond their own self-interest for the benefit of their partner. It’s what transforms a transaction into a relationship. Despite goodwill being “the most precisely defined concept in normative or moral philosophy” (Hosmer, 1995, p. 398) and a vital component of the stronger types of trust (see Week 2), fundamental ethics practices are missing from economics, marketing and management literature. “…the expectation by one person, group, or firm of ethically justifiable behavior – that is, morally correct decisions and actions based upon ethical principles of analysis – on the part of the other person, group, or firm in a joint endeavor or economic exchange” ( p.399). too many disciplines fail to include the obligation- the moral duty– to include the interests of the other party. They also fail to include a description of those ethical principles of analysis. Imagine for a moment that you are a trader involved in the mortgage bundling schemes that led to the global financial crisis or a mortgage lender who knowingly lent too much money to families that could not afford it. How would you answer the ethical screens listed above? It’s no surprise that those corporately sanctioned actions caused severe damage to families, communities and a global economy – they were ethically bankrupt practices that eroded trust. To restore trust, we need, at a minimum, to critically assess our operations and our relationships. 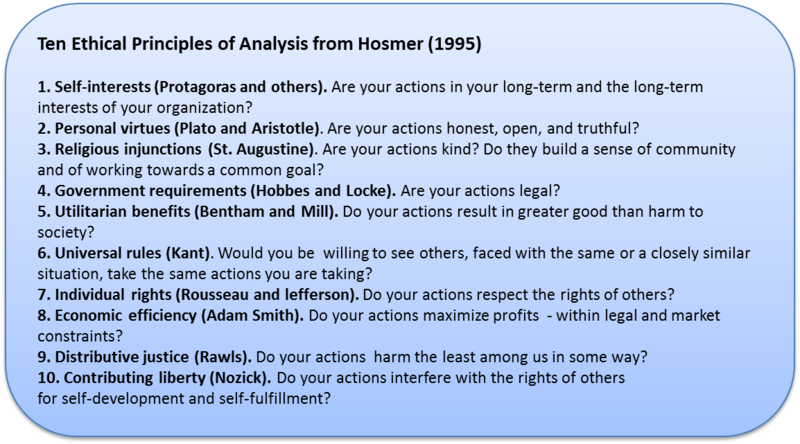 Think of a practice or policy within your organization, does it pass Hosmer’s ethics check? 1. Look at your product, processes, partnerships and promotions to ensure they are ethical in every way. 2. Behave predictably. “…one cannot have trust without norms. To be trustworthy is to have a behaviour of sticking to agreements” (Pollitt, 2002, p.125). 4. Demonstrate intentionality. “Look beyond the legal requirements of an agreement and turn to its ultimate intent” (Gullet et al., 2009, p. 336). 5. Apply the principles of trustworthiness and social responsibility in all cases “even when its application might not be optimal in the short run” (Blois, 2003, p.190) – not because it is commercially advantageous but because it is ethical. I think we misunderstand ethics. We think it’s about playing nicely, staying out of trouble or signing a list of promises every year. It’s an “option” in business schools yet it’s not altruism. It requires self-interest and economic efficiency as much as goodwill. Ethics can provide scrutiny of business practices that are just as valuable as enterprise risk management. In my research, I found that it was the ethics literature that examined the downside of trust (Week 10) while others focused on primarily on costs, benefits or governance mechanisms. Closely examine interdependence, power differences or lack of alternatives that can create feelings of entitlement or of obligation which can be exploited in high trust relationships (Greenwood & VanBuren; 2010; Saini, 2010). Identify potential ethical conflicts that can arise when boundary spanners serve both their organization’s interests and the alliance relationship (Gullet et al., 2009, p. 330). I am by no means an ethics scholar but it is impossible to ignore the lack of focus on ethics and goodwill in much of the broader trust literature; and I strongly believe that therein lies the key differentiating factor for building authentic strong-form trust within and between organizations. The best part is you don’t need additional funding or grand strategies to start asking the right questions in your organization today. ← Lingerie Leadership: Women Only!